The increase in school zone accidents can largely be attributed to the amount of distractions that are available to us today, and become increasingly available every single day. With many drivers already distracted by cell phones, adding distracted pedestrians to the equation is a recipe for disaster. Studies have shown that the biggest pedestrian distraction, especially for teens ages 12-19, are wearing headphones and texting. Developmentally, children are unable to judge the speed and distance of approaching vehicles until age 10. Couple this finding with the fact that most children these days are equipped with cell phones and other gadgets, explains why accidents around schools are so common. 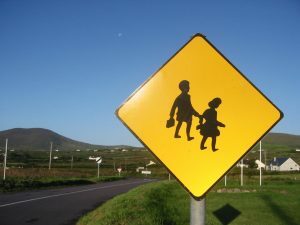 In order to prevent accidents in school zones, it is important that schools and parents exercise caution in and around schools, and teach children and teenagers to do the same. Schools should ensure that their parking lots, and drop off and pick up zones, are well-organized and have an adult monitoring them during peak times. Drivers should remain under the speed limit and pay close attention to crosswalks and signs around the school, while students should abstain from any distracting activity while walking or biking in and around school zones. These measures, while not conclusive, can help to decrease the number of accidents in school zones. If you or a loved one are involved in a pedestrian or vehicle accident in a school zone, it is important to contact an experienced personal injury attorney as soon as possible. Your attorney can help you find and evaluate any liabilities and help you recover any available remedies. While we hope you and your family never run into this unfortunate event, should it ever occur, contact the experienced personal injury lawyers at the Friedland | Carmona as immediately as possible. The South Florida personal injury attorneys at the Friedland | Carmona handle all types of bicycle accident, negligence, product liability, personal injury, negligent security, slip/trip and fall, and car accident cases throughout the state of Florida, including Boca Raton, Homestead, North Miami, South Miami, Miami Beach, Coral Gables, Pembroke Pines, Hialeah, Kendall, Aventura, Fort Lauderdale, and Palm Beach. The Friedland | Carmona handles all types of personal injury cases. Call the Miami personal injury attorneys today and let our family take care of your family.